John Romang creates magic on Plexiglas acrylic sheets—he drops bright hues of ink and resin onto these surfaces and watches them blend and bend and swirl. Now, they have won him an award. The Tanne Foundation, based out of Boston, recently published the winners of the 2015 Tanne Awards on its website, listing only NINE ARTISTS from around the country. Romang’s work, along with a biography and portrait, was included. The Paducah resident and elementary school art teacher believes this means his hard work has paid off. “It made me feel vindicated, I guess I should say, for having my artwork recognized outside of western Kentucky,” he says. Romang’s technique churns ink and resin together to make abstract maelstroms of color. 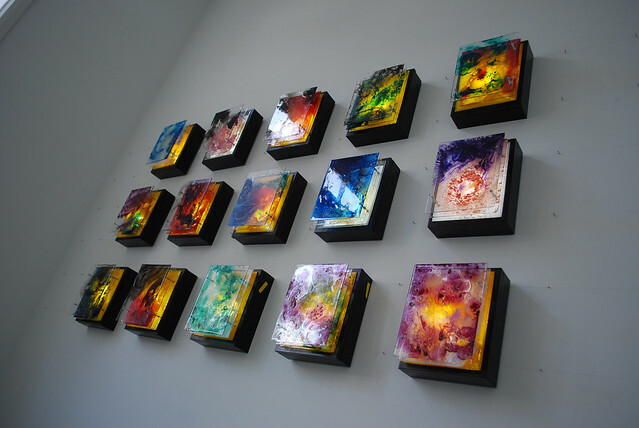 He then illuminates his pieces in light boxes so the colors burn brightly. His website, johnromang.com, lists numerous exhibitions in Kentucky, Tennessee, Illinois, North Carolina, South Carolina and Pennsylvania. He says he does it for the kids. A happy accident helped Romang develop his technique. Five or six years ago, he mainly worked with mixed media. At one point, he says, he was using polyurethane to seal a collage, and he dropped ink onto his work to add color. It reacted chemically to the sealant, and the color almost came alive, swirling and spreading on its own. Intrigued, Romang quit his other pursuits and focused exclusively on ink. He’s switched the polyurethane to resin but he continued to explore the magic of chemical reactions. After several years, that exploration has now won recognition from the Tanne Foundation. Andee Rudloff, a foundation trustee, loves his pieces and his work with children, and she presented him to the organization for award consideration. According to its website, the Tanne Foundation desires to encourage artists and is grateful for their passion and commitment. Through this award, it has thanked Romang personally. In doing so, it has also fueled his quest to be the best teacher possible by being the best artist possible.